The BC Law Schools Competitive Moot is an appellate competition between UVic, UBC and TRU. This year’s question raised a fundamental issue of contract law. This year’s team was composed of Jane Mayfield and Diana Sepulveda as appellant counsel, and Erin Miller and Angela Barna as counsel for the respondents. Both teams won in their respective division, making UVic the winner of the moot. Mooting was an incredible learning experience and a highlight of our time in law school. We received incredibly rewarding and helpful feedback from the judges and our coaches. A special thanks to Professor Newcombe and our many guest judges for their support and feedback. Finally, we thank our coaches Kelly Doerksen, James Legh and Michael Mark for their dedication, encouragement, and guidance along the way. 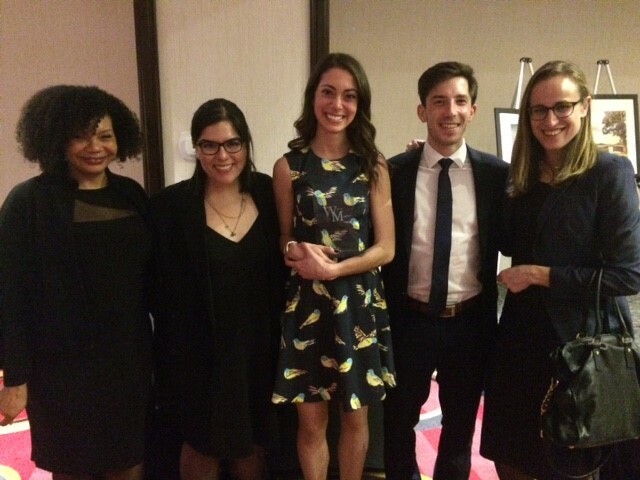 The UVic Faculty of Law had a stellar performance at the 2019 Bowman National Tax Moot, which took place in Toronto on March 1-2. The Bowman Moot, now in its 9th year, is named after the Honourable Donald G.H. Bowman, former Chief Justice of the Tax Court of Canada. The amazing students comprising the UVic team (in order of appearance) were Rebecca Whitmore, Melissa Rumbles, Andrew Tigchelaar, and Ben Hopkins. The humble coaches were Brad Bryan and Geoff Loomer. This year's moot problem was very challenging, addressing the potential application of the "general anti-avoidance rule" to a complex corporate reorganization, which turned in part on the metaphysical question of whether a benefit enjoyed is a benefit realized. Such fun! 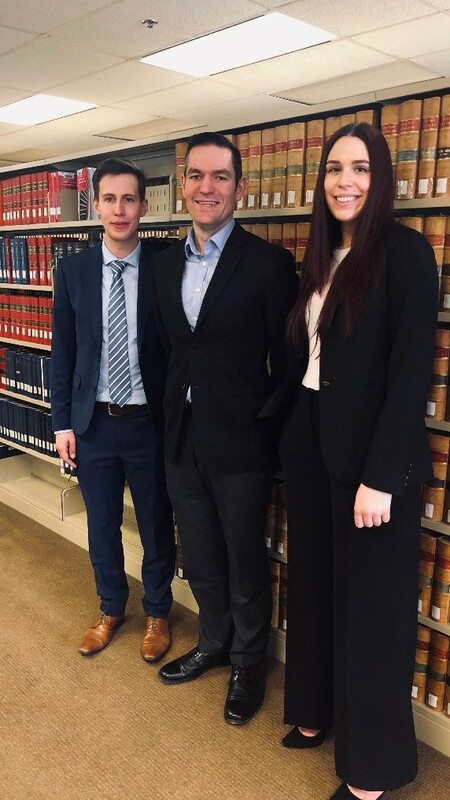 Rebecca, Melissa, Andrew, and Ben put in many hours of preparation and practice and performed admirably in the face of some difficult questioning from the judges, who included practising tax lawyers, Justices of the Tax Court of Canada, and Justices of the Federal Court of Appeal. In the main rounds we faced teams from four other universities, including Montreal and Sherbrooke, who wrote and argued in French. We did not get a chance to face the amazing team from Windsor, who advanced to the semi-finals and finals, eventually winning the main prize. Although we did not take home a prize this year, the students should be very proud of their achievements in terms of research, advocacy, and professionalism. We proved to be the coolest school (if I may say so) and the students were great ambassadors for UVic, both in the competition and the social events. We want to thank the faculty members and members of the legal community who graciously gave their time to assist us with practice sessions, including Mark Gillen, Martha O'Brien, Laurie Goldbach, Jonathan Aiyadurai, Ed Kroft, Deborah Toaze, and Eric Brown. We are particularly grateful to Ed Kroft and his colleagues at Bennett Jones LLP in Vancouver for their support, including the financial support provided by Bennett Jones. We also thank Andrea Feary for her organization and enthusiasm. 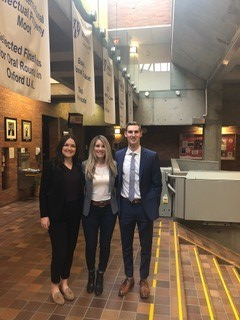 Over the weekend of March 2-3 Ryan Griffith and Kelly Twa competed in the Canadian Client Consultation Competition, hosted this year by the University of Windsor. On day one, Ryan and Kelly interview three different clients. The purpose of the competition is to encourage law students to harness their active listening skills, provide clients with holistic legal advice and incorporate both legal and non legal options for moving forward. The theme of this year’s competition was theft but the competitors were faced with a variety of client problems that touched on employment law, intellectual property, fraud, and criminal procedure. Some of the clients presented challenges involving their mental health, personal relationships or previous criminal records. After the first three rounds, Ryan and Kelly advanced to the semi-finals in the 6th place position. They competed head to head against the team that was holding the first place position and were able to win that round and proceed into the finals. The final round was held on Sunday morning between the top three teams. After presenting before a panel of judges, UVic placed third following the University of Calgary in first place and the University of Edmonton in second. The competitors were very proud of how they placed and left the competition with gratitude for all of the time their coaches Steve Perks, Nicole Smith and Brittany Goud put towards preparing them, and for all of the practical legal skills they gained throughout. The Gale Cup is a criminal appellate moot started in 1974 and considered to be the premier bilingual moot in Canada. Eighteen law schools competed this year including the University of Alberta, Osgoode, and the University of British Columbia, to name a few. Each law school presents a team of four students: two as counsel for the appellant and two as counsel for the respondent. The judges of the Gale Cup Moot Court are Canadian judges from various provinces, including this year Associate Chief Justice Holmes and Mr. Justice Abrioux from the British Columbia Superior Courts. 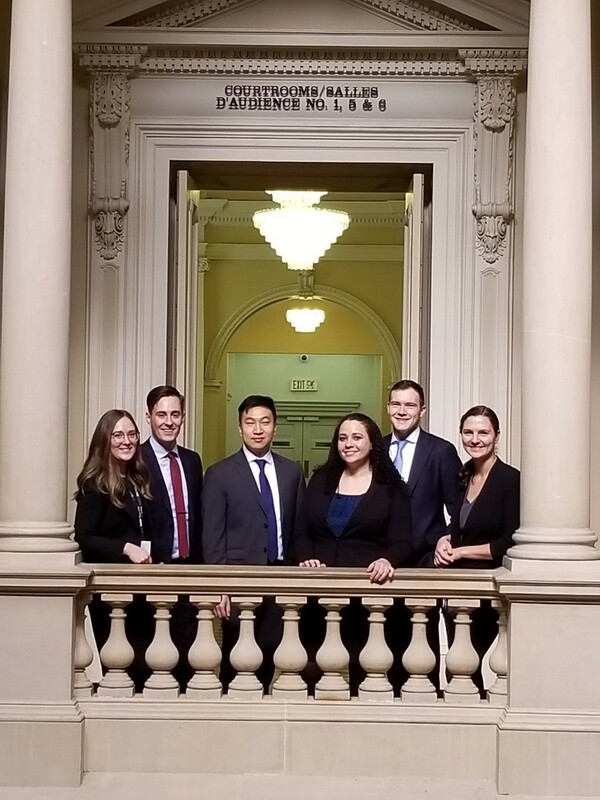 The moot was held on February 15 and 16, 2019 in Toronto at the Ontario Court of Appeal (Osgoode Hall). The case under appeal was R. v. Marakah, a 2017 decision of the Supreme Court of Canada in which the majority of the Court concluded that Mr. Marakah held a reasonable expectation of privacy in text messages seized by police from his accomplice’s phone. Benjamin Martin, Mitchell Ferreira, Erica Johnston, and Andrew Han represented UVic this year. Ben and Mitch acted as counsel for the appellant, Her Majesty the Queen, while Erica and Andrew acted as counsel for the respondent, Mr. Marakah. The UVic appellant team faced off with the Western respondent team on Friday, February 15. The division bench, consisting of Justice Goodridge, Justice Di Luca and Justice Rahman, was incredibly active. During his 30 minutes of questioning by the division, Mitch stood his ground on the appellant’s case and was helpful, credible and eloquent in his answers to the Court. The Court congratulated him on his ability to speak confidently about the issues. Following Mitch on s. 24(2) of the Charter, Ben too was calm and composed during intense questioning. He handled questions with ease, responding with an in-depth knowledge of the facts and law which the Court commented was impressive. The next day Erica and Andrew competed against the University of Toronto appellant’s team. Like her teammates, Erica was resolute in her client’s position even in the face of intense questioning from Justice Farrar, Justice Bird and Justice Andre. She showed a mastery of the subject materials as well as the strengths and weaknesses of her own case. The Court commented on her poise in responding to scrutiny from the division on her position. Last but not least, Andrew followed Erica with well-delivered and thoughtful submissions on s. 24(2) of the Charter. Andrew eloquently answered policy questions from Justice Farrar and provided substantive answers to the Court which showed an in-depth understanding of the issues at the heart of the analysis. UVic should be incredibly proud of the hard work that its team put into competing in this year’s Gale Cup as well as the thoughtfulness and professionalism that each team member showed during the competition itself. Each team member will make an excellent addition to the bar and should be very proud of their performance at the competition. The UVic team and their coaches, Kaitlyn Chewka and Alandra Harlingten, would like to thank all the volunteers, organizers and other teams who participated this year, as well as Peck & Company for its financial support. The competition could not be such a great success without the generosity of all those involved. Until next year! This year the Kawaskimhon Moot was held at the Schulich School of Law, in Halifax, Nova Scotia. It involved twenty-one teams from law schools across Canada. Sharae Antley and Sheyenne Spence represented UVic, and Professors Milward and Morales served as coaches. The Kawaskimhon (which is Cree for “speaking with knowledge”) Moot is unique among moot court competitions in that it is a consensus-based, non-adversarial moot that incorporates Indigenous legal orders alongside federal, provincial and international law. This year’s problem focused on the reform of Canada’s First Nation Child and Family Services Program with parties representing the Innu Nation of Labrador; the Assembly of Nova Scotia Mi’kmaq Chiefs; the Inuit Tapiriit Kanatami; the Chiefs of Ontario; the Splatsin First Nation; the Saskatoon Tribal Council; the Métis Child and Family Authority of Winnipeg; the Counsel of the Atikamekw Nation; UNICEF Canada; Amnesty International; and the Office Youth and Child Advocate of Alberta. UVic’s team acted as representatives for the Splatsin First Nation. The moot involved the presentation of a 20-minute argument and consensus building. It utilized a talking circle format to help resolve the legal issues that arise from the selected topic, which helped us engage in critical comparative discussions in a way that acknowledged Indigenous dispute resolution mechanisms. Despite this, we still found it challenging to try to manage so many ideas and keep true to our position, while at the same time respecting the viewpoints and experiences of others. It was interesting to see the diversity of issues and viewpoints brought forward during the circle. There were many highlights for us. First, we were fortunate enough to hear Dr. Cindy Blackstock speak at the opening, and lucky for us, more intimately with our negotiation groups. What really stuck out for us, was she stated that “we must do law with love to ensure that children grow up happy and healthy, receive a good education and grow up proud of who they are.” This comment became a major element in our negotiations and we believe that it ultimately helped our group come to a consensus on some major elements. Second, Dr. Val Napoleon really brought home the importance of storytelling in describing, interpreting, and deliberating law. For us, this was the essence of our proposal (we utilized the Story of Owl throughout our piece) and we believe that she was able to really ground our piece for the other groups at our table. Our biggest takeaway from the moot is that child welfare reform is complex, messy, and challenging. That said, as First Nations, Métis, and Inuit Peoples we have to ultimately trust our abilities as self-governing and self-determining peoples. We have both the rights and obligations to care for our children in the best way possible. The McIntyre Cup is a one-of-a-kind trial level moot in the area of criminal law. 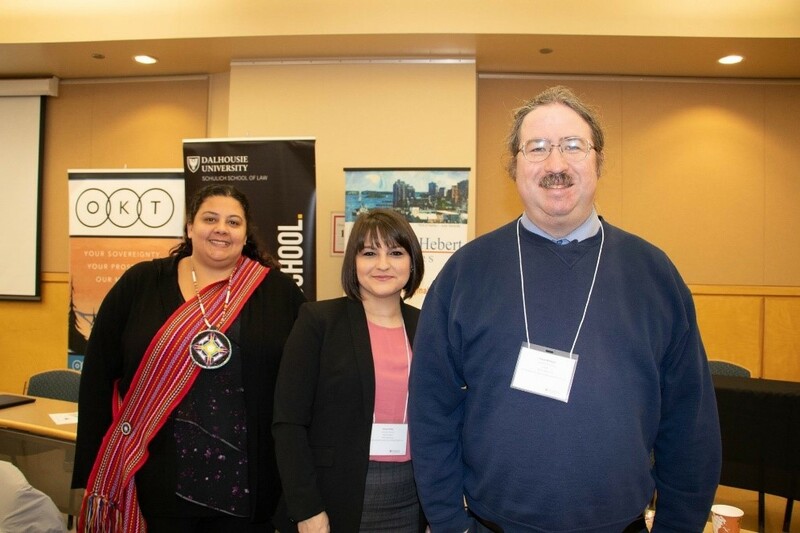 The 2019 moot was hosted by Thompson Rivers University in Kamloops. Britani Gough and Colton Dennis represented UVic this year. The fact patterns in the McIntyre are usually long, complex, and include statements from rather unreliable witnesses. This year’s problem, which focused on a convenience store robbery, included two Crown and two Defence witnesses. Our team represented the Crown, and faced a bit of a problem in that the Crown witnesses seemed about as likely as the accused to have committed the robbery. Because we prepared well in the months leading up to the competition, though, we were able to build a pretty good case. At the competition, we executed our plan to a T. We traded (figurative) blows with our friends from the University of Manitoba, taking turns direct and cross examining the actors who were playing our “witnesses”. In a couple of shining moments, we put the credibility of the opposing witnesses in serious question. At the end of the moot, the assessors complimented our advocacy skills and the materials that we had prepared. While we did not finish in the top three teams in the competition, we walked away feeling that we had put on a strong performance. Thompson Rivers University did an excellent job hosting the competition. Our team really enjoyed participating in the events that the organizers arranged, and had a great time making friends with mooters from the other participating schools. Additionally, we were extremely lucky to have two great coaches in Clare Jennings and Lorne Phipps, both of whom put in countless hours preparing us for the competition. A big thank you to them as well as UVic and the BC Crown Counsel Association for giving us the chance to be part of this unforgettable experience. 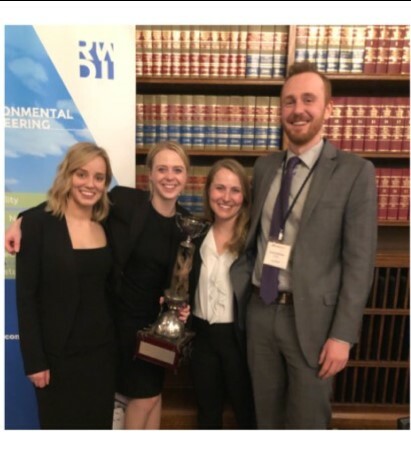 The 2019 Willms & Shier Environmental Law Moot took place at Osgoode Hall in downtown Toronto. While the moot involved the recent case of Orphan Well Association v Grant Thornton Ltd 2019 SCC 5 addressing whether federal bankruptcy is paramount in relation to provincial natural resources jurisdiction, for the UVic team the moot turned out to be one of cooperative federalism as the University of Saskatchewan team pitched in when one of our team members was unable to travel to the moot. It took some fancy footwork on the part of the team’s coach, Tim Leadem QC, to figure out this creative solution at the 11th hour after pouring over the rules and tracking down a team who was willing to share their third team members. After the Co-Chairs of the moot granted leave to substitute members, Tim secured the participation of two of the University of Saskatchewan team, one of whom each mooted in the first two rounds. Anchoring the UVic team on the day of the moot, Nick Tollefson mooted with Kaitlin Ward and then Courtenay Catlin from USask to advance and secure one of four spots in the semi-final round. At that point, with both the UVic and USask teams advancing to the semis and jokingly calling ourselves team 35 (team 3 for USask and team 5 for UVic), the Co-Chairs of the moot called an emergency meeting to decide what would happen if both teams made it to the finals. That did not transpire, but we are delighted with our top 4 finish. So in a case that turned in part on co-operative federalism, a big shout out to the University of Saskatchewan team members who were willing to take a chance on us, have fun, and, with half of our UVic team, performed spectacularly under the circumstances. 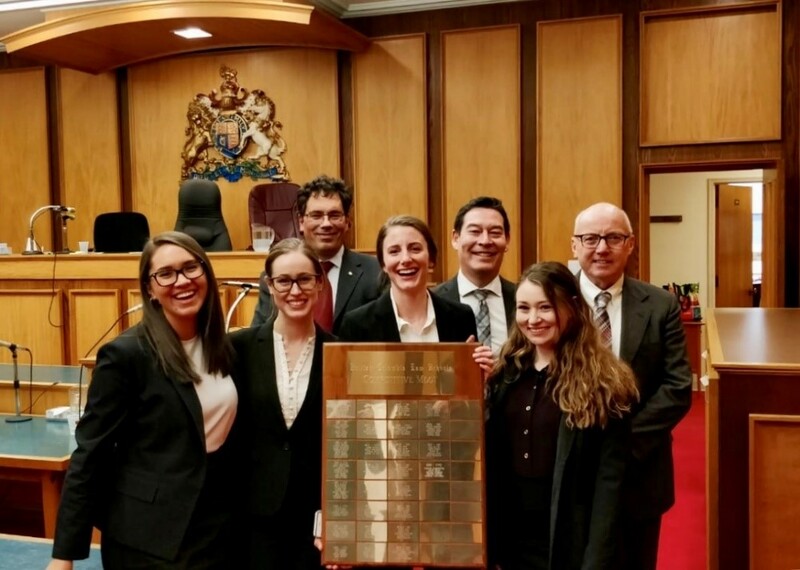 Congratulations to the USask team who went on to win the 2019 moot, appearing before a bench that included Madame Justice Côté who was the dissenter in the SCC on this case. Many thanks to Nick Tollefson and Jordyn Bogetti for all of their hard work leading up to the moot. Special thanks to Tim Leadem QC for coaching and travelling with the team, and Professor Deborah Curran for administrative and practice support. The students who participated in the Wilson Moot found the experience exciting, exhausting, and enriching. Chris Barran, Nico Bernardi, Suzy Flader, and Rachael Gardner travelled to Toronto to litigate a statutory age cut-off for in vitro fertilization under s. 15 of the Charter. Throughout the mooting process, they gained invaluable advocacy experience and benefited from the feedback of guest judges and—especially—their exceptional coaches, Tyna Mason and Leah Greathead. Team member Nico Bernardi came away with the prize for third place oralist. The whole team snuck in a star-struck visit with Professor Peter Hogg, and soaked in the talent and expertise of moot judges and fellow competitors. The team is grateful to the Faculty of Law and to Hunter Litigation Chambers for their generous support of this learning experience. The team would also like to thank Tyna and Leah and researcher Lianna Chang for their incredible hard work and support throughout the process.